Remember that “cellar door” thing in “Donnie Darko”? How creepy that was? 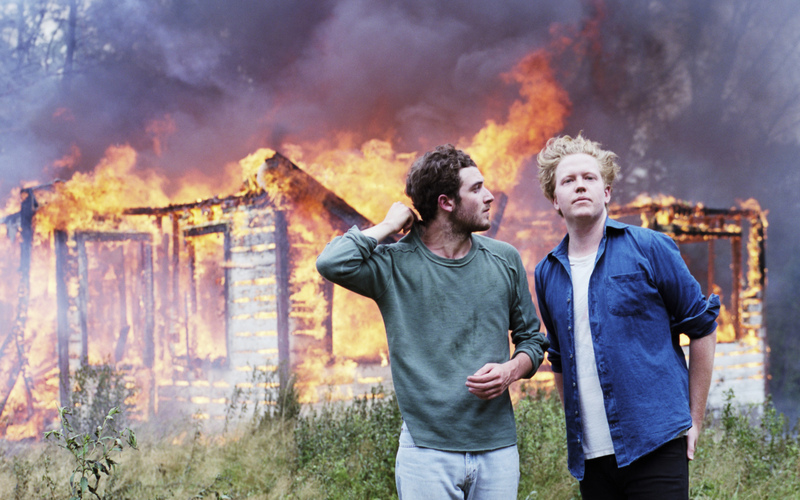 Talking to Nicolas Jaar and Dave Harrington about their band Darkside’s debut album creepily reminded me of that phrase: Jaar kept repeating, in the slowest possible way, how important it is to make music that functions like an entrance, a gateway, a door, wide open, leading to something unexpected (and creepy, you’ll see), so the listeners can experience new and different (and dark) sonic landscapes and sensations. The first Darkside album, entitled “Psychic” and dropping two years after the duo’s tasty 3-track EP, does just that: Combining Jaar’s solo production preferences (lots of space, lots of bass) and Harrington’s rather experimental guitar tastes, it places a whole bunch of things rock (cosmic to classic) in a shape-shifting club framework and makes you want to lock that door from the inside (and swallow the keys). Nico, where are you guys at right now? Nico: We’re basically on a rooftop where we can see all of Manhattan, right on the rooftop of our rehearsal space. So you guys share a space, or is it just for now, for this collaborative project? Dave: Well, we just moved into this place in Greenpoint to rehearse for the live show. Nico: Yeah, it’s our place. Sounds nice. How did you guys first meet? So you must have had quite high expectations then? Nico: Yeah, I guess I did. Sounds easy enough, especially since you had first started out as a producer because that didn’t require working with other people, right? Nico: Absolutely. That’s exactly how I started. I guess what ended up happening is that after 5, 6 years – well, now it’s been really 8 years – of making electronic music every single day of my life, I just wanted to communicate. I wanted my music to be a little more human and have a human component. If I’m there in the studio with someone else, and we’re both playing instruments – and that’s how we’re finding ideas, as opposed to looking at a computer – that was so much more exciting. However, the main thing is this: you can get a very specific kind of noise out of a computer, but the type of noise and the type of capacity that you can get out of a guitar, which is essentially metal and wood, it’s very particular and amazing. I don’t play guitar, so it’s exciting to be collaborating with Dave. What are your feelings about computers, Dave? Or do you only focus on guitars? Dave: Well, when I first started playing with Nico it was actually the first time I had ever really played guitar in a band. I mean I’ve played guitar since I was a kid, but from a pretty young age I didn’t focus on guitar, because I was a bass player. I played mostly acoustic, upright bass, playing jazz. Later on I had some bands, I played keyboards, and I had, like, this band in college, playing noise music and free-jazz and such. So I’ve done a lot of different things. I had kind of dabbled in electronic music, but I didn’t really know anything about the tree that leads up to Nico’s work, whatever that is, and so when I first started playing with him it was exciting for me because it was all very new. I’m always kind of game for anything, and ultimately it doesn’t really matter: to me it doesn’t matter if it’s a computer, because in many ways it’s about the person, you know? For me, you can almost tell when you meet someone, so even before you play with them, you can tell if it’s going to work or not. I just felt that way with Nico. We have a relationship where we really understand each other, and we can kind of reach each other’s minds a little… you know, computer, synths, guitar – we have a dynamic, and that dynamic is rare. You can only get that with so many people on the planet. It’s funny that you just said “you can read each other’s minds a little” – is that where the album title comes in: “Psychic”? Dave: Yeah, very much. I mean it’s just the two of us here, working together, and in order to find the third thing, which is Darkside, which is the music, we kind of have to read each other’s mind. It’s also what comes naturally for us. So did you stick to your roles – guitar guy/producer guy – while recording “Psychic”? Or did it change a lot while in the studio? Dave: Well, I never sing, and Nico never plays guitar, and beyond that there’s a lot of room in terms of what we can do. Like, “Oh, this track needs an electric piano part, maybe I can come up with something. Or no, Nico, maybe you should do it.” So the way we’ve been working was very fluid and open. It’s not so much about I’m going to do this, you’re going to do that, it’s rather: between the two of us, we can kind of do whatever we want. We have these different-but-overlapping skill sets, so it’s more about trying out different versions. Was the album done when you did the Daftside project? Dave: Yeah, we actually did that right after we finished the album. And we did it really just because it was fun. You know, the last days of finishing an album, it’s very focused and intense – getting it mastered, the final mixing – and then when we’d finally finished it, we did this one remix, and it was so much fun and it was so easy; it was just such a different way of making music so that we kept doing more. It was so much fun. Sounds like working on the album wasn’t so much fun. Was it hard work? Nico: Yeah, it was a lot more difficult, and it took a lot more time. Remixing something is like a vacation. And doing your own music is really fun, but then you have to make songs, and that becomes a little more complicated. You also want to be honest with what you want to do, and that makes it a real job: You have to put your entire body and mind and soul into the project. I see, and you’ve stated before that making music is always about soul searching for you. How much soul searching was working on this one, and what kind of answers – or lessons – did you find while searching? Ha, first it sounded like a description of pop music: this friendly stuff… but are those bodies lying around hinting at the weirder and more experimental things you’re also drawn to? Nico: Right, but what I want to say is that experimentation for experimentation’s sake is not interesting to me. Weirdness for weirdness’ sake is not interesting either. What is interesting is: having a door wide open for EVERYONE to come in, and then for them to realize that what is inside is a little more complicated than what they thought. And so, yeah, maybe the door is comparable to the door of pop music, but once you’re inside the house – which is the most important thing: that you go inside the house –, once you’re inside the house you realize that the house is going to burn in 24 hours or that there are some real troubles with the house. Was it easy to place all the different elements – the cosmic side, the rock, the club stuff – in the right corners of this house? Nico: It was more what came naturally to Dave and I. When Dave and I work together and hang out, we were a little more rave-y, but we’re also a little more experimental than we are when we are alone, and when you put two heads together to write a song, sometimes you end up with more kind of pop structures, and sometimes you end up with crazier structures. The way I see it, it wasn’t calculated, it was much more just simply the meeting of two minds at a certain point of time. So you didn’t have a particular starting point for those songs? Nico: No, it was pretty chaotic the way we did it. Sometimes it would be a guitar loop, sometimes it would be a bass line, sometimes it would be a sample – it really depends. Speaking of houses, parts of it were recorded in a barn upstate, right? How did that influence the working experience? Dave: Yeah, I have a small studio at my family house in the Hudson Valley, an hour or so north of the city. I’ve been going there for five or six years now to work on music, and it’s just a special place with a very good energy. A quiet place where I can make lots and lots of noise, so it’s a very specific kind of energy, and it’s just that the limit of experimentation is infinite in that place. A room in a barn, filled with drums and broken keyboards, loud amps, where anything can happen. So yeah, different pieces from there ended up on the album. What about the burning little house that came as artwork for the first track you released online? Nico: Well, we made a nice little house, then we put some things inside of that, hopefully you went in, and now we burnt it. Nico: No, no one got burned inside. No, no, no, just the house. What about other visual things, videos etc.? Nico: Actually, we will not be doing so much visuals, this is going to be just a good-old music show. It’s going to be just two musicians, on stage, making everything that you hear coming out of the speakers. In a way, it’s a little more old-fashioned. Just the two of us, that’s the band, that’s it. I also wanted to talk about literature vs. music, since you’ve done this degree in Comparative Literature. Is bringing things together in your music comparable to the way you dealt with literature? Nico: Yeah, maybe, maybe it’s similar but I studied Comparative Literature alone, and Darkside is Dave and I working together. Funny thing is that the thesis that I did and the one that Dave did, when you combine them, it ends up being Darkside as well. I did a thesis mainly on Faulkner, and Dave wrote a thesis about intensity and media, you know, television. I think when you combine those two things, you end up with Darkside also. So I think everything influences everything. I mean I wouldn’t say that our album is influenced by our work as scholars or whatever, but then again everything is influenced by everything. Dave, tell me some more about that thesis! Dave: Well, for a while I was doing a lot of performance art, and I was writing this thesis that was about the physical sensation and the physical experience of extremity in media, in terms of recorded sound – for example in screen depictions of violence. Think Gaspar Noé, Michael Haneke, and it’s about the way oral or visual stimuli can create a physical experience for the spectator, the listener, the viewer. When you see something you think about it, but also you can feel it somehow, and not an emotional feeling, but on a visceral, physical sensation level. Through that I got very interested in doing music where your whole body becomes consumed in a physical environment. So that was, at least in part, your goal with this album? Dave: I used to be very conceptual about things, but now I try not to calculate so much. So I plug in my guitar, and somewhere in my brain there is a Gaspar Noé switch, I guess, and maybe I hit that switch sometimes, but I don’t think I want to make Gaspar Noé guitar sounds right now. I kind of just let it happen. I used to be like: “I’ll do 20 minute solo electric bass, like Francis Bacon,” and now I don’t think that way anymore. At a certain point it’s all interiorized, and then you don’t have to calculate anymore, and then what comes out is maybe a little more honest. For the live show, does that mean there’s going to be lots of improvisation? Nico: Yeah, it’s going to be a Jackson Pollock live set. Ha, I see. Let’s wrap this up: Nico, why did you close down Clown & Sunset, and what can you tell me about Other People. Nico: Other People is just a weekly, issue-based label. So we tell you the story but it’s given bit by bit, every Sunday. I stopped Clown & Sunset because it started sounding like something I didn’t really feel associated with, and I didn’t feel like it gave a good enough platform for the artists that I wanted to have on this next label Other People. Yeah, I see, and one other thing: bass and sadness are linked, you once said, that still your opinion? How does that affect your music? You keep adding bass – to the house? But then people are going to run away from house, as long as the door’s still open. Nico: Honestly, usually you don’t even hear it. You don’t even hear bass; you just feel it. That’s what’s cool about bass, it’s just completely intuitive. You can really think about it, like, “this is what the bass line is doing,” but bass is nothing you really hear. I like that. It’s subtle. It’s subtle, and it’s way beyond everything. You know, bass is the dark side of music. The Darkside… does it feel this project is going to be around for a long, long time? Nico: Yeah, it’s not a project, it’s a real band, and this band is going to be around forever.